There are over approximately 18.2 million Asian Americans living in the U.S., and over one million are settled here in the greater Los Angeles metro area, according to the Census Bureau. May is Los Angeles Asian Pacific American Heritage Month, an important celebration of the diverse culture, rich history, and unique traditions of Asian Americans and Pacific Islanders all over the United States. The goal of Asian Pacific American Heritage Month, designated in 1992, is to recognize great achievements, commemorate history and, ultimately, to share stories. And that’s exactly what The SaySay Project of FilAm ARTS, a nonprofit Filipino cultural arts organization based here in Los Angeles, aims to do. The mission of the Association for the Advancement of Filipino American Arts and Culture (also known as FilAm ARTS) is “to facilitate community synergy and transformation by advancing the arts and diverse cultural heritage of Filipinos through arts services, presentation, and education,” according to its website. Basically, it’s about people. It’s about breaking down color and language barriers by celebrating cultural diversity and promoting the arts within the diverse community. One of FilAm ARTS’ newest initiatives, The SaySay Project, aims to engage the Filipino-American community in this idea of “talking story.” The Filipino phrase “SaySay”—pronounced sigh-sigh—is a Tagalog word that means “to have intrinsic value, and to declare.” Sharing stories that highlight both Filipino and the larger Asian American culture is what The SaySay Project, established just last year, is all about. Essentially, it is a creative way to connect tales of the Asian American experience to other stories, so that these narratives can be documented and preserved for future generations. Promoted by FilAm ARTS and The SaySay Project, and in celebration of Asian Pacific American Heritage Month in Los Angeles, a new art exhibit observing Filipino American culture and history is opening this weekend. 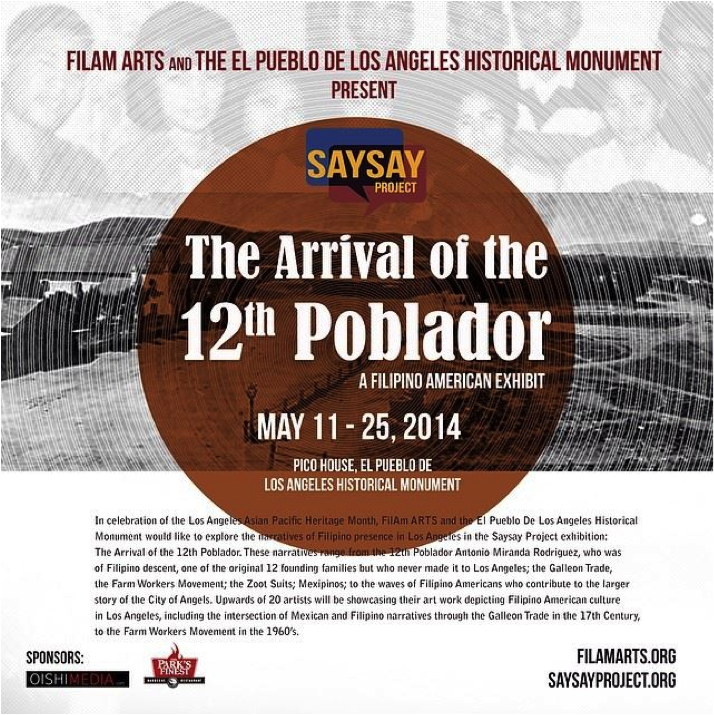 The exhibit, entitled “The SaySay Project: The Arrival of the 12th Poblador,” is on display for two weeks from May 11–25,at the Pico House Gallery in the historical El Pueblo de Los Angeles monument. Visual and performance artists are invited to display their work in the upcoming exhibit that, according to the press release, “explores the narratives of Filipino presence in L.A.” Canizares also points out the significance of looking at the historical narrative in the SaySay Project, because it is symbolic of the arrival of Filipinos in Los Angeles—and in particular, the 12th Poblador himself, who marks the beginning of this important story. In 1781, 50-year-old Antonio Miranda Rodriguez was en route from Mexico to the historic Pueblo de Los Angeles, a not-yet-established new settlement in Southern California, with 11 other colonizers and his young daughter. Governor Felipe de Neve had chosen the green valley of Los Angeles, after its discovery by Spanish explorer Gaspar de Portolá, to be settled as one of the firstpueblos in California. The settlers came from everywhere: Spaniards, mestizos, mulattos, even native Indians. Rodriguez was the only settler—called a “poblador”—that was of Filipino descent. According to the Los Angeles Almanac, both Rodriguez and his daughter fell ill to smallpox while journeying to Alta California, present-day Southern California, with the rest of the pobladores. For this reason, their trip was delayed. However, many authors and historians argue that Rodriguez actually made it to L.A. after recovering from the smallpox, and helped to establish the original pueblo in the late 18th century with the other settlers. Still other narratives claim that Rodriguez never made it to what is now modern-day Los Angeles, but was reassigned to settle in the Santa Barbara presidio in 1782 and became a skilled gunsmith and armorer. Some say he remained in Santa Barbara for the rest of his life and became the ironsmith of the Santa Barbara Mission, the church where he is now buried. Whichever story is true, it is likely that Antonio Miranda Rodriguez was one of the original founders of the great City of Angels, and was a pureblood Filipino. Whether or not he actually made it to Los Angeles, being a part of the original group of pobladores he was still significant in the discovery of a diverse, historical, and richly cultured city. The FilAm ARTS exhibit at the historic Pico House Gallery will celebrate the story of the lost “12th Poblador,” Antonio Miranda Rodriguez, and commemorate his achievements to the hundreds of Angelenos and Filipinos who are unaware of their roots. Following the 333-year inquisition of the Philippines by Spain, Filipino culture is still very widely influenced by Spanish tradition. Many of these customs were brought to the U.S. with immigrant families, passed on from generation to generation. The exhibit aims to explore the similarities between Spanish and Filipino culture, art, dance, theatre, and even religion. It will celebrate the “Mexipino.” a unique blend of Filipino and Mexican Americans who are in many ways influenced by one another both culturally and historically. It will showcase traditional art, conventional, and inspirational art—movements, installations, performances, even full-length videos—that each tell a different story. “The Arrival of the 12th Poblador” exhibit seeks to highlight Filipino figures in government, artists, activists, students, and immigrant voices. It will include a variety of presenters from contemporary artists, to social realists, to cultural dance groups. Each artist’s work will reflect upon this theme of making connections of Filipinos with the narratives of L.A., and look at the large waves of Filipino Americans who contribute to the larger story of our city’s history. Ebojo, who goes by Alfie Numeric, is a local contemporary artist whose work is driven by a love for her Filipino heritage and her­-story. Numeric’s piece, entitled “Princess Urduja: the Warrior,” celebrates an ancient female Filipino legend that not too many people actually know about. Numeric, who has been quite active with FilAm ARTS and The SaySay Project for a number of years, is showcasing a mixed media painting for the exhibit. Her work represents a piece of each indigenous tribe around the Pangasinan province in the Ilocos region of the Philippines. Numeric did her research in depicting each tribe’s own story and culture, reading books, talking to family members, and making connections between the two. She claims to be inspired by Bell Hooks’ All About Love: New Visions and the classic Chinese military treatise The Art of War, by Sun Tzu. Womanhood, identity, and human rights are just a few abstracts to be explored at the L.A.-based exhibit opening this weekend. Other Filipino-American social artists, from painters, authors, and photographers, will look at this central theme of the power of people—a people who continue to struggle, to work, and to have hope for the future. Part of what makes us American is our understanding of who we are as a rich, diverse culture, one that is uniquely made up of a variety of colors. By commemorating events and sharing narratives, we begin a dialogue that brings people together, remembering where we each came from and how we got here, and we suddenly become one. This is what Antonio Miranda Rodriguez, the 12th Poblador to California, surely must have dreamed of when he first arrived. For Los Angeles, a city of many different shades, the exhibit is, in essence, a story of this place we call home.